Zebra LP2844 labels - Genuine Zebra direct thermal labels for Zebra LP2844 direct thermal label printers, supplied on 25mm cores. Direct thermal labels do not require the use of a thermal transfer ribbon to print an image. The range includes Z-Perform 1000D (economy) and Z-Select 2000D (premium topcoated) materials and is guaranteed to work with Zebra LP2844 and LP2844-Z printers. The Zebra LP2844 is a 4 inch wide direct thermal printer from Zebra Technologies. It is ideal for print shipping and distribution labels and is widely used for ebay despatch labels. FeedYourZebra.co.uk only supplies Genuine Zebra labels and ribbons. Zebra barcode labels for LP2844 printers ensure reliable, high-quality printing. Our Zebra LP2844 direct thermal barcode labels are performance-matched to Zebra LP2844 label printers for crisp, dependable output. 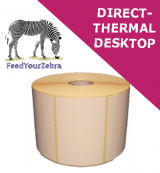 The Zebra LP2844 is a direct thermal printer and uses Zebra direct thermal labels. Labels are supplied on 25mm cores. The following label types are suitable for the Zebra LP2844 desktop printer.